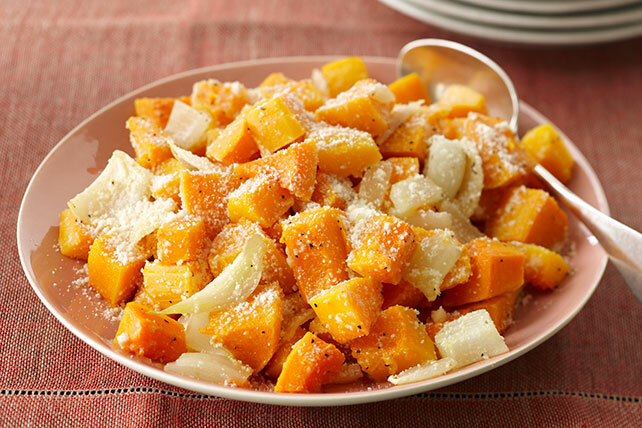 Kick up the fall menu when you make our Baked Butternut Squash with Parmesan Cheese recipe. Our Baked Butternut Squash with Parmesan Cheese is a hearty, flavorful dish that is sure to win you compliments! Toss squash with 2 tsp. oil on rimmed baking sheet; spread evenly onto bottom of baking sheet. Bake 20 min. Add onions, pepper and remaining oil; mix lightly. Spread to form even layer on bottom of pan. Bake 20 min. or until vegetables are tender. Drizzle with broth; mix lightly. Sprinkle with 1/4 cup Parmesan; toss to coat. Transfer to serving bowl; sprinkle with remaining Parmesan.